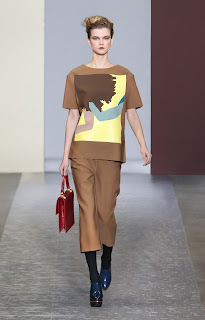 Creative director of Marni, Consuelo Castiglioni has made it a tradition to collaborate with artists by incorporating prints derived from their paintings in her ready-to-wear collections. For the Autumn/Winter 2010-11 collection, Castiglioni has collaborated with the British artist, Gary Hume, the one-time YBA and Brit-art contemporary of Emin and Hirst. Hume dramatically simplifies his subjects by using bold blocks of colour and is in perfect harmony with the Marni Autumn Winter 2010 collection’s severe line and “uneasy” saturated colour and matte textures. 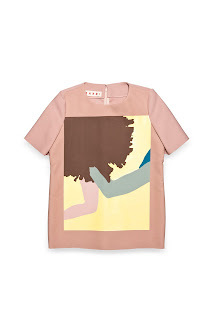 Hume’s images appear on double face cotton printed tops making for a highly graphic and unique look. It was the series of door paintings that first made Hume’s name. These minimal and abstract works with their high gloss paint and insistent reflective surfaces first caught the eye of Charles Saatchi and jolted British art out of its stupor. Just like his bold and dynamic artwork, Gary Hume’s inclusion adds a twisted yet elegant mood to Marni’s Autumn/Winter 2010 collection. Please feel free to add a comment in the box below or in the ‘shout mix’ box opposite. If you like the blog, please vote for it under ‘lifestyle’ at The Cosmopolitan Blog Awards (link supplied on top of page).